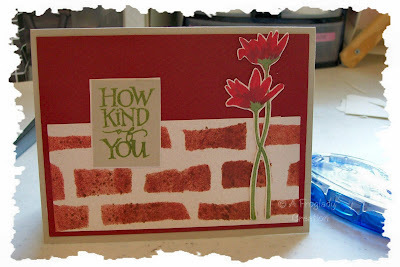 I made this faux Brick background for a challenge on Stamp Something Blog. it is a past challenge but I wanted to go back and catch up the ones I missed while life was crazy busy here. Check out the spotted texture of them just like a real brick. I would love to say I was following the TJ tutorial from April 2008 (if you go there tell Pat I sent you) and that is why but really it was some funky stuff laying on the top of my CTMH inkpad that did that. I don't know why it is that way it looks dried out and has all these bits and pieces of yuk on top. Well I wasn't paying attention and rolled the brayer onto it already so I figured what the heck - it is just paper right. 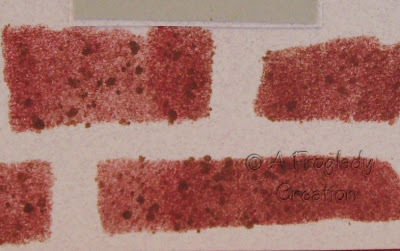 No need for a splatter stamp or to somehow "spray" on top to get the look. this is the finished card which I was also practicing my Copic coloring on. Not so sure on it as the markers covered up the stamp lines inside the flowers which I think are just pretty on their own but I do like the shading of them, darker at the base and lighter at the top.